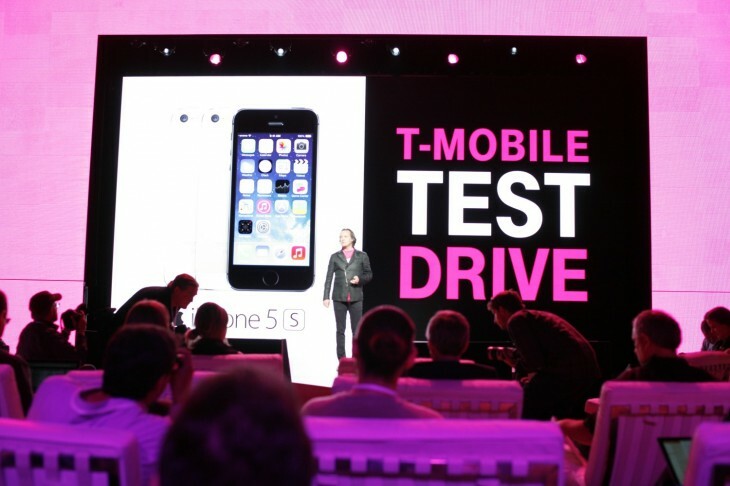 At its Uncarrier 5.0 event, T-Mobile today announced “Test Drive,” a new service that will let customers check the quality of the carrier’s network on an iPhone 5s for seven days. The program, in partnership with Apple, kicks off on June 23. After the seven days, you’ll need to drop off the phone at a T-Mobile store, but you won’t have to put any money down for the test. T-Mobile announced new progress with its Wideband LTE and Voice over LTE (VoLTE) services. The company plans to offer full national VoLTE coverage in the US by the end of the year. T-Mobile’s Uncarrier strategy has unfolded over the past year. Last March, the company kicked off the branding with the launch of its LTE network and new Simple Choice unlimited plans. T-Mobile then introduced Jump, an upgrade program of dubious value. Other initiatives include free international data and free tablet data. At CES in January, T-Mobile began paying early termination fees (ETFs) for customers as version 4.0 of Uncarrier. Between abolishing ETFs and its new test drive option, T-Mobile is putting the squeeze on competing carriers. Paying off contract fees reduced the cost of switching, but many customers expressed concern about whether T-Mobile reception in their area would be good enough. Now, they can see for themselves while still keeping their old plan as a backup.